As safety becomes increasingly prevalent in the transportation industry, safe driving rewards programs are becoming more and more common. With drivers looking for opportunities to increase their earnings, companies are offering significant financial rewards to drivers who have a proven track record of safety on the road. As the industry leader in safety, Bison Transport's Safe Driving Rewards Program (SDRP) was one of the first of its kind and has proven to be one of the most successful rewards programs in the transportation space. Established in 2005, Bison's SDRP has issued over $27 million in financial rewards to its Drivers since its inception. Roger has completed over 3.25 million consecutive safe driving miles. 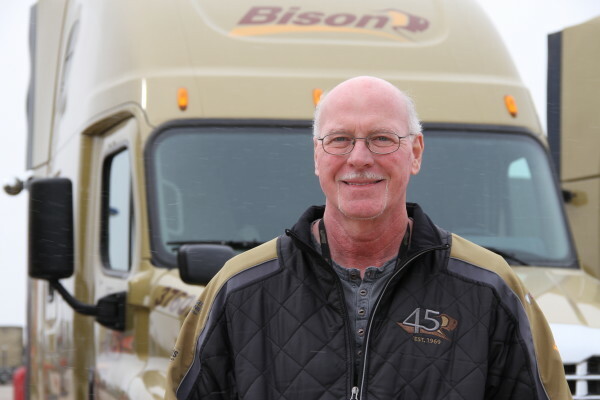 "The Safe Driving Rewards Program gives us a monetary incentive to focus on safety, working our way up the bonus scale mile by mile, with a sense of pride," said Roger Maltman, a Bison Driver who is on pace to reach 3.5 million safe driving miles this year. The Safe Driver Rewards Program pays substantial financial rewards to worthy Drivers for every safe mile on the road. The program is unique in the industry, as it is tied only to safe driving miles in which a Driver has not been involved in a preventable accident. Many safe driving programs tie a myriad of other safety related items into the criteria, making it virtually impossible and very confusing to attain any of the promised incentives. At Bison, every mile on the road means more money earned, with Drivers eligible to earn more per mile as they reach higher safe driving levels. An entry-level Driver will be paid $0.01 per mile or $0.30 per hour, with the potential to earn as much as $0.055 per mile or $2.70 per hour at the highest level. In the case of Owner Operators or Lease Operators, rewards are paid to the tractor. Not only does Bison's rewards program offer great compensation and clear guidelines to attain rewards, but we also provide industry leading equipment, compreh ensive training and a Right to Decide policy that puts Drivers in an ideal position to attain accident-free miles and maximize rewards. "Ultimately it's me behind the wheel, but there are a large group of people doing their jobs with expertise, which enables me to do my job at a high performance level," Roger said. "Thanks to the safety, maintenance and operations departments." Even if a Driver does have an off day and gets in an accident, they are still eligible to earn rewards and won't be unfairly punished for a rare occurrence. If a Driver is involved in a preventable accident, he or she will only be subject to the loss of one quarter (minor accident) or two quarters (major accident) of their accumulated Safe Driving Reward. The Driver will also move down three levels in the program, but can never drop below the first level. This protection offers more experienced Drivers at higher safety levels the opportunity to continue to earn higher rewards, promoting our desire to have Drivers accumulate consecutive safe miles and achieve the highest possible safety level. After paying out more than $3.3 million in safe driving rewards last year, 2017 marked the largest payout year since the program was launched. Top level Drivers will earn in excess of 15% more through the Safe Driving Rewards Program.